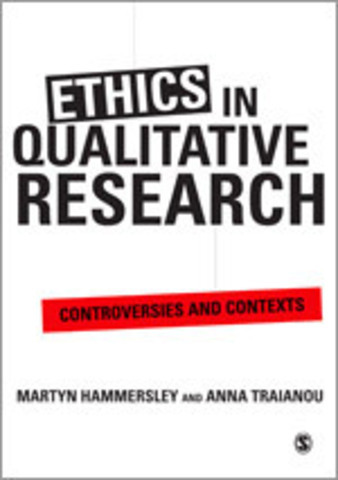 The ethics of qualitative research has long been an important topic for methodological reflection and discussion, but in recent years it has also become a prominent part of research methods ‘training’. There are several reasons for its growing salience. One is the fact that developments in bio-medicine stimulated a growth of ethical regulation in the field of health research, which subsequently spread to other areas of social inquiry. This process occurred first in the United States, but has taken place in many other countries as well, and it is a development that has particularly sharp consequences for qualitative research, because the model of inquiry on which regulatory guidelines and arrangements are based is often at odds with that approach. At the same time, the fragmentation of qualitative research into a diverse array of paradigms has generated conflicting attitudes towards what counts as ethical research practice. For instance, on top of older conflicts between those adopting what we might call moralistic versus Machiavellian stances, more recently there has been rejection of ‘liberal’ approaches to research ethics in favour of feminist, child-centred, communitarian and postmodernist ones. Another factor behind the growing concern with ethics has been increased use of the Internet as both a means and a field of qualitative inquiry and the growing use of visual data. These generate some distinctive issues about the nature of research participants, their rights and researchers’ responsibilities towards them. This text has two main aims. 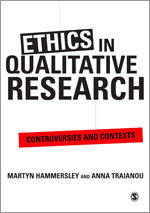 One is to explore different perspectives on research ethics and the controversies these raise. Too many discussions of research ethics imply a bland consensus, instead of tackling the sharply conflicting views to be found amongst researchers and among other stakeholders. The aim here is to explore the grounds for these different positions, and to engage with their implications for key aspects of the research process. There is a discussion of different forms of ethical argument - relating to intention, consequences, rights and obligations - drawing on the philosophical literature, given that these lead to potentially very different views on the part of researchers about their responsibilities: as regards to whom are they responsible, and for what. The ethical issues covered include harm, respect for autonomy, exploitation, privacy, and representation. The second aim of the book is to explore the situated character of ethical judgments: that they always take place in, and are affected by, particular contexts; and that very different conclusions may be reached depending upon the circumstances involved, for example the nature of the people being studied, in particular whether they belong to vulnerable or to powerful groups in society. Ethical judgements are examined in relation to: funding arrangements, access negotiations, data collection strategies, and the presentation and dissemination of research findings. In each of these areas, consideration of ethical issues are grounded in discussions of how they arose and were dealt with in particular studies. There is also a chapter dealing with the issue of the control and regulation of research: from contractual obligations, through the development of professional codes, to the surveillance role now being performed by ethics committees within universities and other institutions. The book aims to facilitate critical reflection on ethical issues as these arise both in the course of doing research and in assessing the work of others. Given the way that current developments are forcing ethics up the methodological agenda, this is especially important at the present stage in the development of qualitative research.